Later that day, my girlfriend and I tried to make a batch of cookies according to her grandmother’s instructions, but no matter how hard we tried, they always turned out like normal cookies. Somehow we were missing something. Whatever makeCookies does, as long as it’s a pure function — where its output depends only on its declared inputs — its signature states that it transforms a list of ingredients into a batch of cookies. Sounds good to me. Assuming that mix is a pure function, this looks good. Whoa. Hold on just a minute … now I’m confused. What is love? Where does love come from? These statements essentially mean the same thing, so I prefer the first statement: to think of love as being a hidden input into the function. It wasn’t passed in as a function input parameter, it came from … well … it came from somewhere else … the ether. Imagine that makeCookies is the only function you have to write today — this function is your entire scope for today. When you do that, it feels like someone teleported love right into the middle of your workspace. There you were, minding your own business, writing a function whose output depends only on its inputs, and then — Bam! — love is thrown right into the middle of your work. Put another way, if makeCookies is the entire scope of what you should be thinking about right now, using love feels like you just accessed a global variable, doesn’t it? 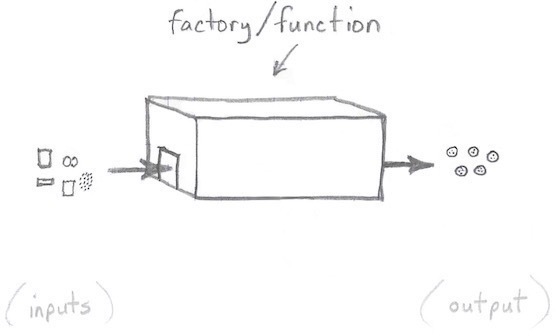 With pure functions I like to think of input parameters as coming into a function’s front door, and its results going out its back door, just like a black box, or a factory, as shown in Figure [fig:cookieFactory]. 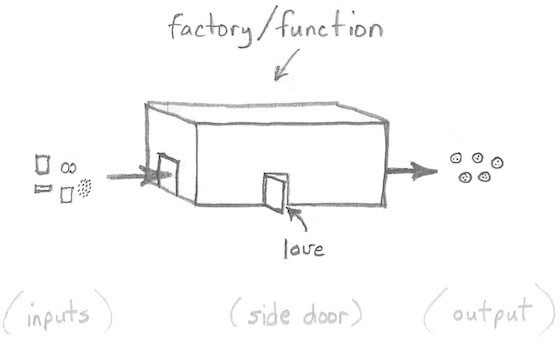 But in the case of makeCookies it’s as though love snuck in through a side door, as shown in Figure [fig:cookieFactorySideDoor]. 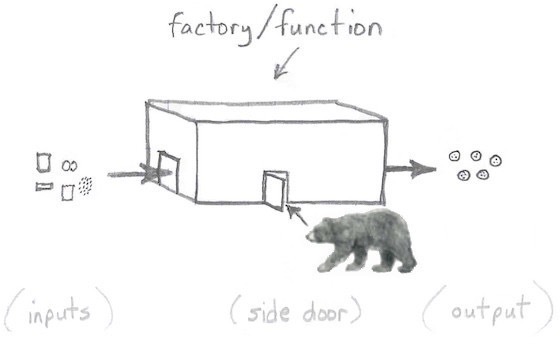 While you might think it’s okay for things like love to slip in a side door, if you spend any time in Alaska you’ll learn not to leave your doors open, because you never know what might walk in, as shown in Figure [fig:cookieFactorySideDoorBear]. I like to “speak in source code” as much as possible, and a little code right now can show what a significant problem hidden inputs are, such as when you write a unit test for an impure method like makeCookies. If you ran this test once it might work fine, you might get the expected results. But if you run it several times, you might get different results each time. That’s a big problem with makeCookies using love as a hidden input: when you’re writing black-box testing code, you have no idea that makeCookies has a hidden dependency on love. All you’ll know is that sometimes the test succeeds, and other times it fails. If you have the source code for makeCookies and can perform white-box testing, you can find out that love affects its result, but that’s a big thing about functional programming: you never have to look at the source code of a pure function to see if it has hidden inputs or hidden outputs. I’ve referred to hidden inputs quite a bit so far, but hidden outputs — mutating hidden variables or writing output — are also a problem of impure functions. Does love have a default value? How is love set before you call makeCookies? What happens if love is not set? Questions like these are problems of impure functions in general, and hidden inputs in particular. Fortunately you don’t have to worry about these problems when you write pure functions. When you write parallel/concurrent applications, the problem of hidden inputs becomes even worse. Imagine how hard it would be to solve the problem if love is set on a separate thread. Programmers also say that makeCookies depends on the state of love. Furthermore, with this coding style it’s also likely that love is a mutable var. My apologies to my wife’s grandmother for using her in this example. She was the most organized person I ever met, and I’m sure that if she was a programmer, she would have written pure functions. And her cookies are sorely missed. My unit test was written using ScalaTest. When you need to use specific quantities in Scala applications, Squants offers a DSL similar to what I showed in these examples.